Karen Ann Hopkins resides in northern Kentucky with her family on a farm that boasts a menagerie of horses, goats, peacocks, chickens, ducks, rabbits, dogs, and cats. Karen’s main job is home schooling the kids, but she finds time to give riding lessons, coach a youth equestrian drill team, and of course, write. She was inspired to create her first book, Temptation, by the Amish community she lived in. The experiential knowledge she gained through her interactions with her neighbors drove the story of the star-crossed lovers, Rose and Noah. 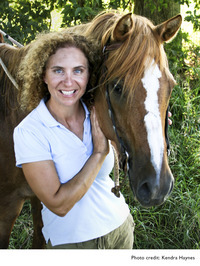 You can visit Karen Ann Hopkins at her website: www.karenannhopkins.com. To ask Karen Ann Hopkins questions, please sign up. Karen Ann Hopkins I can work from home, giving me the opportunity to continue homeschooling my children and having more time to enjoy my farm and the animals. The final book in Wings of War series is available!
" I loved the classic feel to this novel! The Spirit Keeper is a beautiful frontier romance, filled with rich descriptions and vivid characters. Sevente I loved the classic feel to this novel! The Spirit Keeper is a beautiful frontier romance, filled with rich descriptions and vivid characters. Seventeen-year-old Katie O’Toole is the courageous heroine at the center of this bittersweet coming of age story, where twists and turns keep you glued to the pages as you join Katie on a remarkable adventure. K. B. Laugheed brings a brutal and fascinating time period in history to life, with a well-written and compelling story that will stay with you for many days after you close the book. ...more "
We’d love your help. Let us know what’s wrong with this preview of The Spirit Keeper by K.B. Laugheed.
" We were still being kept apart. Would it ever end? Was a time of peace and acceptance in or lives possible? We’d love your help. Let us know what’s wrong with this preview of Forever by Karen Ann Hopkins. "WOW! What can I say? Just fantastic fiction! We’d love your help. Let us know what’s wrong with this preview of Embers by Karen Ann Hopkins.
" Have you read the YA Temptation series? The 4th book in the series, Rachel's Deception is out in May. Just had the cover reveal. What do you think?Rac Have you read the YA Temptation series? The 4th book in the series, Rachel's Deception is out in May. Just had the cover reveal. What do you think?Rachel's Deception ...more "
“It was strange how in that moment of tragedy, it had seemed so unreal, like an old-fashioned movie reel playing on a screen for my eyes only. The pain and broken heart were blocked off for a little while, leaving me numb with disbelief. Shock is what Dad called it. But after a while, the cruel reality started to seep into my tissues, and my body became a sponge, just sucking it all up until, finally, there was so much grief inside, I couldn't help feeling it. “Pressing my head to his heart, I listened hard, straining to hear any gurgle or murmur of life. Hearing nothing, I felt the shock settle into my mind, slowing it down and then turning it off. "Don't leave me, Noah. Please, don't go," I whispered into the darkness as the light spray of rain touched my face. Looking forward to reading your stories starting with Noah and Rose. So excited to announce that a fourth book in the Temptation/Meadowview series will be out in June! RACHEL'S DECEPTION will include POV's from Rose, Rachel and Justin. All your favorite teens from the Meadowview Amish community are back as they are deal with rebellion, shunning and forbidden love in this YA romance thriller. Thanks for the friendship Karen!